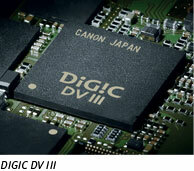 Designed and built by Canon for the highest HD RGB processing, the DIGIC DV III Image Processor uses proprietary circuits and architecture to deliver the highest image quality at the highest speeds, with low power consumption and minimal heat output. 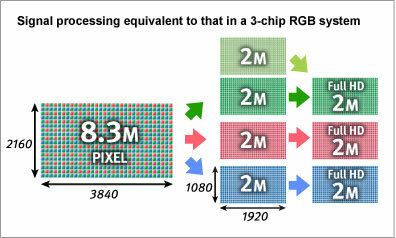 It processes the RGB representations originated in the single CMOS sensor of the camera into three channels (Red, Blue and Green) to maintain the rich resolution and clean color fidelity formerly possible only in three-chip sensor designs. To create digital files robust enough for major post-production, the EOS C300 delivers the highest image quality with its XF Codec - the same codec used by other Canon XF - professional camcorders. 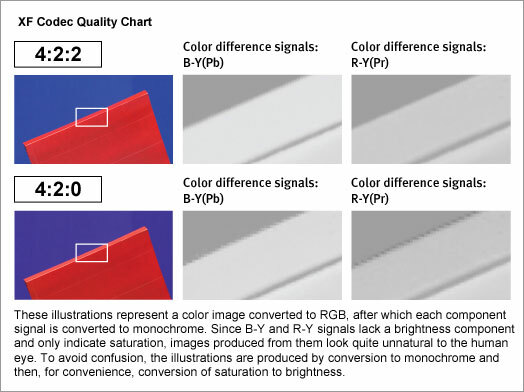 With 4:2:2 color sampling, image files have double the vertical resolution of color components created with 4:2:0 color sampling, minimizing jagged edges between red and blue and ensuring ample quality for chroma key compositing with green screens. Thanks to the Canon XF Codec and the EOS C300's superior resolution, original color quality and cinematic look will hold up through post-production - with results that meet or exceed the filmmakers expectations. 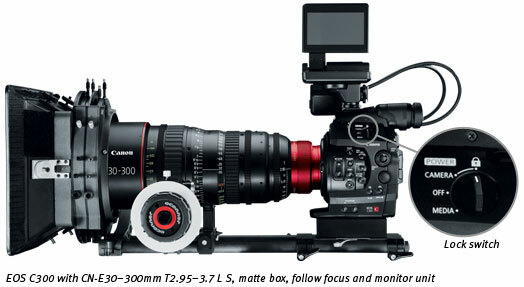 To integrate easily into the working style and equipment array of film crews and production houses, the EOS C300 with a Canon EF-lens mount is completely compatible with all of Canon's EF lenses, including compact primes, super telephotos, specialty Tilt-Shift, Macro and Fisheye lenses - over 60 in all. 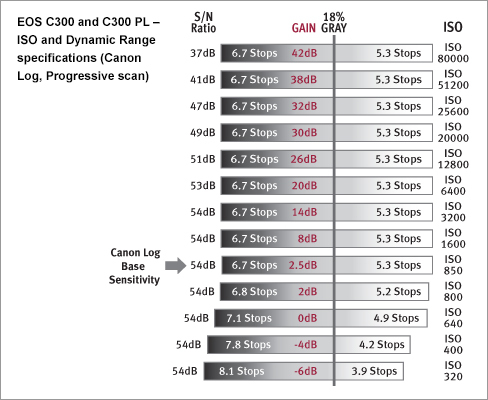 A unique combination of the world's most advanced optical, microelectronic, and precision manufacturing technologies, the Canon's EF lenses, compatible with the EOS C300, are perfected in Canon's laboratories and proven in the field. Whatever the application, whatever the budget, there are Canon EF lenses perfect for nearly every scenario. Their compatibility not only affords the Cinema EOS access to some of the finest optics on the market, it opens up myriad possibilities with Canon's superlative specialty lenses, including a range of Tilt-Shift lenses, Close-up lenses and even Canon's amazing EF 8-15mm f/4L Fisheye Zoom. 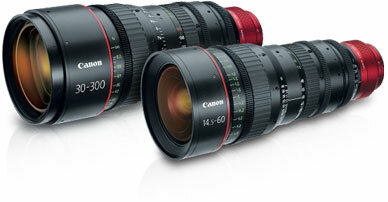 Canon EF Cinema lenses are designed and engineered to meet or exceed the exacting standards of working professionals. Every Canon EF Cinema lens is designed to fulfill contemporary 4K production standards, surpassing the performance requirements of any HD imaging system. Zoom lenses feature large aspherical lens elements to achieve sharp, consistent images in every shooting situation. Geared inner focusing minimizes focus-induced changes in the angle of view, rendering focus breathing virtually zero. The 11-blade aperture diaphragms ensure smooth out-of-focus areas and beautiful bokeh - and innovative glass construction counteracts barrel expansion and contraction to avoid temperature-induced marking discrepancies. EF Cinema lenses provide markings on angled surfaces on both sides of the barrel, making it easy to read focus and aperture settings from behind or either side of the camera. Focus markings can be switched from standard labeling to metric. Control rings are designed to maintain the proper amount of resistance with consistent operating torque. 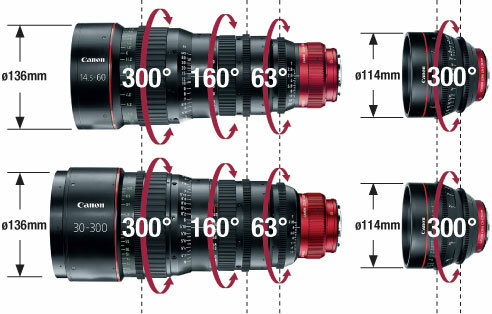 EF Cinema lenses share uniform gear position, diameter and rotation angle as well as front lens diameters, enabling the film crew to quickly change to another Canon zoom or prime lens or compatible third-party accessories like matte boxes and rods without adjustments. 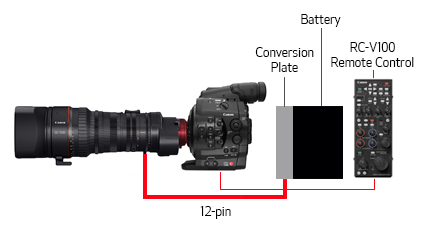 The versatility of the Canon Cinema EOS approach also makes it compatible with more cinema optics than any other camera system. EF-mount EF Cinema Prime lenses are compatible with Canon EOS DSLRs - including full-frame models like the EOS-1D X and the EOS 5D Mark II as well as cameras like the EOS 7D and EOS 60D and their APS-C sized sensors. Canon's Cinema EF Zoom lenses offer unrivaled optical performance for demanding high-end productions, available in both EF and PL mount configurations. With fluorite, aspherical lens elements and advanced optical design, these unequalled Cinema EF Zoom lenses are capable of 4K-image reproduction. The wide-angle CN-E14.5-60mm T2.6 L S/SP provides industry-leading breadth of range; the telephoto CN-E30-300mm T2.95-3.7 L S/SP rivals best-in-class zoom magnification and telephoto focal length. 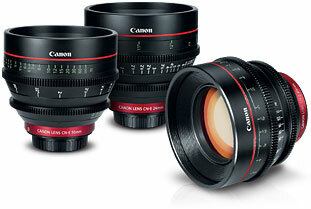 Together these lenses cover the range most commonly used in cinema shooting. The brilliant series of Cinema EF Prime lenses offers spectacular 4K-image quality in lightweight, compact designs. Three models for EF mount cameras - CN-E24mm T1.5 L F, CN-E50mm T1.3 L F, and CN-E85mm T1.3 L F - offer consistent form factors and marking optimized for motion picture production. Whether you shoot with a Canon EOS C500 or EOS DSLR, the compact and consistent lens design makes for excellent handling. Audiences will also love the results from the 11-blade aperture diaphragms, fast t-stops and proven Canon lens elements. Additional lenses are already under development, reflecting Canon's commitment to offer the broadest range of professional cinema lenses to meet filmmaker's needs, now and in the future. With everything a cinematographer needs, the EOS C300 comes ready to produce. A logical layout of buttons and dials make operation simple. A lock switch turns off all controls except the recording button and function buttons. Small ridges between the buttons help prevent activating functions by mistake. A backlit display panel is great for low-light viewing. A tally lamp is clearly visible from the side or behind the camera. The EOS C300 body is surprisingly small (5.24" x 7.0" x 6.7") and easily hand-held at just over 3 lbs. There is a bright 1.55 megapixel electronic viewfinder that comes bundled with a removable combination 4-inch, 1.23 megapixel monitor and control panel. The camera also has a removable hand grip with a control dial and function buttons for hand-held shooting in DSLR style - or remove it and use the supplied thumb rest for completely stripped down shooting. The EOS C300 has a manually-operated built-in Neutral Density glass filter offering 1/4, 1/16 and 1/64th steps of filtering. Hand-held or using a tripod, on location or in the studio, even on 3-D rigs, the EOS C300 fits shooting situations that are challenging for larger cameras. The EOS C300 features a 0.52-inch, 1.55 Megapixel Color EVF and approximately 100% field of view coverage for comfortable viewing and accurate judgment of composition, focus and color. The angle of the viewfinder is adjustable for additional user comfort. 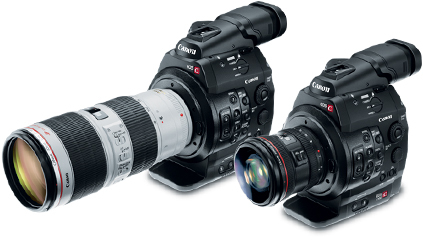 For versatility and reliability, the EOS C300's recording and terminal specifications are completely compatible with the prevailing industry standards. 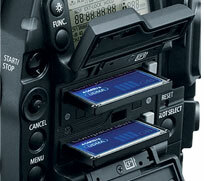 It records to CF cards through dual slots. From a cost and reliability standpoint, CF cards have no equal. Solid state, and easy to find, 2 hours of 4:2:2 50 Mbps footage can be recorded on two reusable and hot swappable 32 GB CF cards with ease. It's even possible to record to two CF cards simultaneously and relay-record for uninterrupted shots and copy from one card to another. With the realities of production in mind, the EOS C300 can record in a number of different modes, resolutions and frame rates, delivering quality recordings perfect for any application. 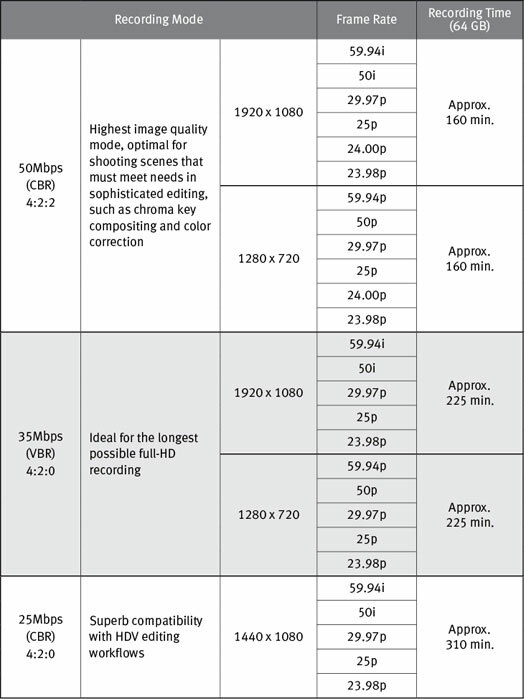 24.00p mode matches the exact frame rates of film cameras, so there's no need for time-consuming frame-rate conversion. And the camera can shoot in both PAL and NTSC modes at 50 Mbps (CBR), 35 Mbps (VBR) and 25 Mbps (CBR) with a range of settings for resolution, color, frame rate and recording time. Whether shooting with the expectation of significant editing and post-production, recording for compatibility with HDV editing, or simply creating the longest possible HD image files, the EOS C300 camera will perform flawlessly. Beyond the advantages of file-based recording, the EOS C300 offers a number of creative possibilities in post-production. 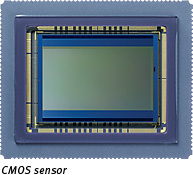 By capturing fewer frames per second, the camera can transform normal action into intense high-speed motion up to 60x. By capturing more frames per second, the camera can slow down motion to 1/2.5x at 720p. The EOS C300 can also be programmed to record a set number of frames at defined intervals for amazing time-lapse photography - and a frame-recording feature is perfect for stop-frame animation. To connect to external monitors, switchers, VTRs and NLE systems with SDI inputs, the EOS C300 features industry-standard HD-SDI Output, Genlock, and Timecode terminals plus audio terminals with Linear PCM recording. Timecode and Genlock enable synchronized multiple camera capture, perfect for multiple camera shots, 3D acquisition and more. The HD-SDI Sync terminal can be switched to output to HD Sync, HD Y, Black Burst, and Composite. Providing the cinematographer with everything they need in the palm of their hands, the EOS C300 comes ready to produce. The cameras have a Waveform Monitor (WFM) function that shows the overall brightness of a scene, with RGB Parade Display to view red, green and blue brightness or Spot Display to isolate the luminance distribution of a chosen area. The Vectorscope (VS) display shows real-time hue and saturation levels. 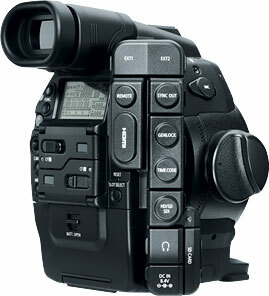 For sharp focus, the EOS C300 camera has two peaking modes and a magnified focus assist function. An Edge Monitor Focus Assist provides both a waveform representing the overall degree of focus and a red waveform that represents focus in three specific areas displayed on the camera's 4" LCD monitor. To maintain proper highlight exposure, it offers a zebra bar feature as well. It's all in the camera. With the November 5th, 2015 firmware update, EF Lens communication has been expanded to allow servo lens control from the from the RC-V100 remote control. An external battery/power source is necessary to drive the lens, as power cannot be supplied by the camera. Offering a new level of mobility, the Canon Wireless File Transmitter WFT-E6A opens up a world of wireless options to the EOS filmmaker. The EOS C300 camera comes preconfigured so that camera settings can be viewed and controlled on third party devices with web browsers, including computers, smartphones and tablets without the need for additional in-camera software. With the WFT-E6A module the camera can be controlled from up to 150 feet away over an 802.11 a/b/g/n wireless network. The WFT-E6A enables superior camera control: users can start and stop recording; adjust focus, white balance, gain and other parameters; and adjust the aperture of Canon EF lenses. This offers huge potential for specialty applications where cameras must be controlled remotely such as nature documentaries or reality TV. It also enables input marking for metadata; and offers a live view of the composition. It supports incorporating GPS information into the file metadata - useful for general cinematic applications, and essential for expedition filmmakers. A basic window mode even enables use with the Apple iPhone®, iPod touch® and iPad®, as well as with handheld devices operating the Android™ operating system. (1) HD tri-level signal (HD Sync) The HD standard analog component Y signal with the black muted is output. (2) HD-Y signals (HD-Y) Only the HD standard analog component Y signal is output. (3) Black burst signal The SD standard analog composite signal with the black muted is output. (4) Composite; The SD standard analog composite signals are output. 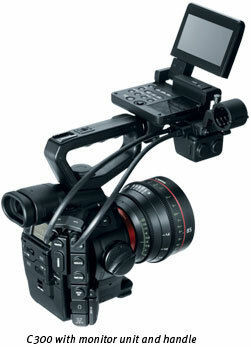 * Weights for both models include the grip, monitor unit, BP-955, 2x CF cards. 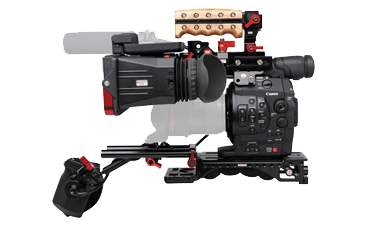 ** Weights for both models include the grip, monitor unit, Handel Unit, BP-955, 2x CF cards. The versatile RC-V100 Remote Controller for EOS C-Series Digital Cinema cameras and the XF305/300/205/200 Professional Camcorders provide full access to all important user functions. Partnered with over 50,000 content creators, Maker produces and distributes a wide range of programming across genres. Director of Photography Eric Robbins and acclaimed writer/director Ti West pull back the curtain on horror film The Sacrament, explaining why the Canon EOS C300 was the right tool for their creepy found-footage thriller. VICE on HBO takes you deep into the world’s biggest political and cultural clashes. To capture the hair-raising stories you see on screen, VICE Media’s Director of Photography Jake Burghart and Segment DP Jerry Ricciotti are no strangers to shooting in extreme conditions.